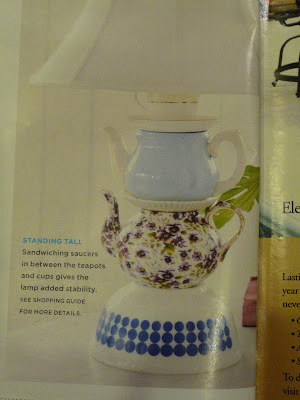 Teapots and Polka Dots: Ummm, No. I love teapots and teacups. I love using old things. I love recycling things in creative, clever ways. But sometimes it's better to leave well enough alone. For example, this idea, from a reputable national magazine (which shall remain nameless). The editors suggest creating a lamp base out of mismatched bowls, pots, cups, and saucers. The electrical cord on this...assemblage...doesn't even run down the middle of the stack, where it would be hidden, but jumps straight off the socket. So they call for tacking down the errant cord to the lamp base with electrical tape. Eeuuw. How about leaving lamp design to the professionals and brewing some strong tea in one of those pots until the bad idea to use them as decorating mercifully passes?